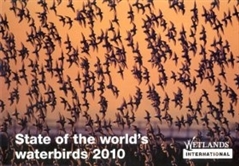 Summarises what is known about the status of waterbird populations in different parts of the world, shows how numbers and population trends compare from region to region, and how they changed between the 1970s and the 2000s. The principal threats to waterbirds and their habitats around the world are summarised and illustrated with examples. Although populations in Europe and North America increased over the period, globally 45% of waterbird populations are still in decline. In Asia this rises to 67%.